Flexible and portable supercapacitors have been intensively investigated due to their reliable energy storage performance and promising applications in wearable electronic devices. 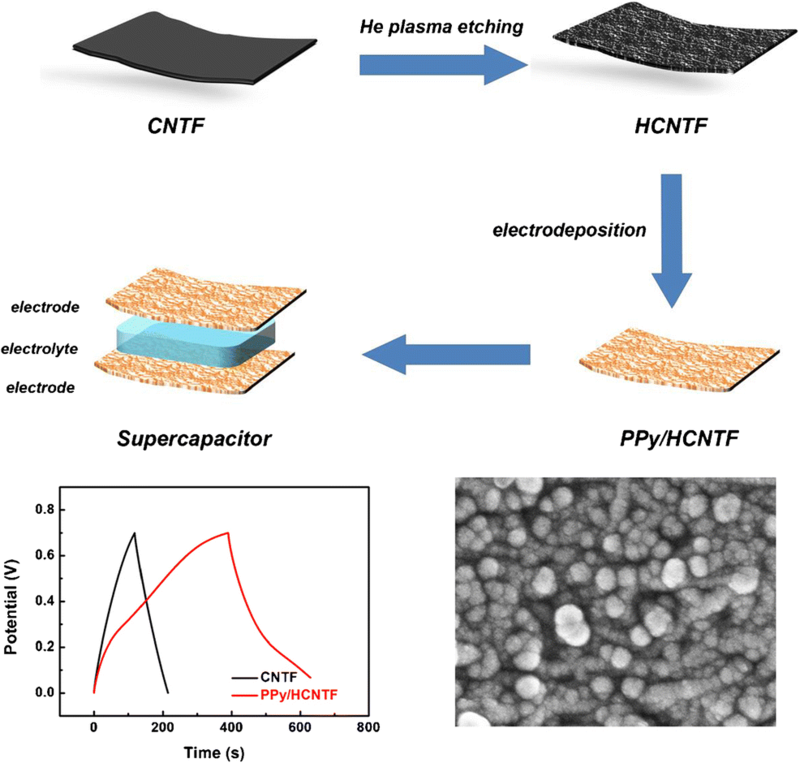 Owing to the unique pseudocapacitance property of conducting polymer and the high conductivity and stability of carbon nanotube film (CNTF), polypyrrole (PPy) was electrodeposited on He plasma etched carbon nanotube film (HCNTF) for electrodes of flexible supercapacitor with high performance. As demonstrated by Raman spectra and contact angle measurement, He plasma etching can produce amorphous carbon on the CNTF and advance the hydrophilicity of the CNTF, which promoted the electrodeposition of PPy onto the CNTFs and improved the adhesion between PPy and CNTF. All-solid-state supercapacitors were fabricated using the PPy/HCNTF electrodes and H3PO4/PVA electrolyte. Cyclic voltammetry tests showed that the capacitive performance of PPy/HCNTF is much higher than that of PPy/CNTF. 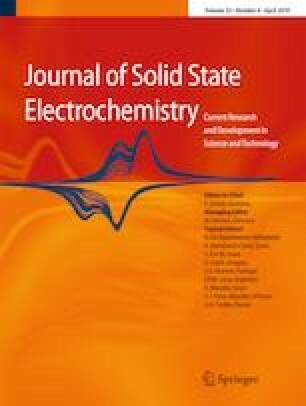 The specific capacitance of the PPy/HCNTF supercapacitor determined by a galvanostatic charge-discharge method at 0.5 A g−1 is about 414 F g−1, which was maintained 92% after 5000 cycles, reflecting high cycle stability. Moreover, the PPy/HCNTF supercapacitor could remain 96% of the original capacitance when it was bent for 500 times surrounding a cylinder with a diameter of 1.5 cm, showing perfect flexibility and great potential for flexible energy storage devices. Polypyrrole/He etching carbon nanotube film was prepared for electrodes of supercapacitors. He plasma etching promoted the electrodeposition of polypyrrole and improved the performance of the supercapacitors. The online version of this article ( https://doi.org/10.1007/s10008-019-04242-4) contains supplementary material, which is available to authorized users. This work was supported by Zhejiang Provincial Natural Science Foundation of China (No. LQ18E030012) and National Natural Science Foundation of China (No. 51302246).